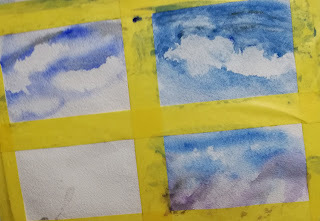 Finally, after practicing washes we're ready to start on clouds! Keep a tissue handy and let's get some cool clouds! Very lightly sketch the cloud shape. Look at some real clouds and draw a basic shape or go with the examples here. Keep some blue, i choose ultramarine if i want to get that lifted fluffy cloud,but cobalt blue,is also a good option. The reason being a staining colour won't let us lift the white clouds. You need a 150 lb or 300gsm paper for we are literally going to pour water on the paper...actually with a thick flat brush or your thickest one. wet the paper, thoroughly till the cloud area or above the horizon line. Use your palette to make a mix as thick as coffee, not milk or water. Paint the top and just run the brush along,; the loaded brush will help carry and you must have noticed in your practice how the pigment spreads. Don't stop it let it splash on it's own. Then quickly before the shine of the paper vanishes scrunch your tissue and lift out into the shape you sketched, but if it goes elsewhere don't worry just go on lifting shapes thick at the top and narrow on the bottom. Practice, till you grasp the technique. Once you've lifted, let the paper dry! Then mix up some grey with ultramarine blue and burnt umber . Use burnt umber sparingly. Mix blue and add little by little burnt umber, then a little more blue till you get a grey shade. the mixture should be of coffee thickness! Touch the brush to the tissue so don't have too much paint and touch the bottom of the clouds you created and touch lightly. Take a damp brush touch to tissue and soften the grey.Use purple in other examples. A thicker coffee mixture of blue can also shadow the clouds! There your cloud is ready and dazzling. Tell us how this went and address your problems to me! It would be lovely to see proof of the pudding! Do subscribe and get your lessons and updates through mail!